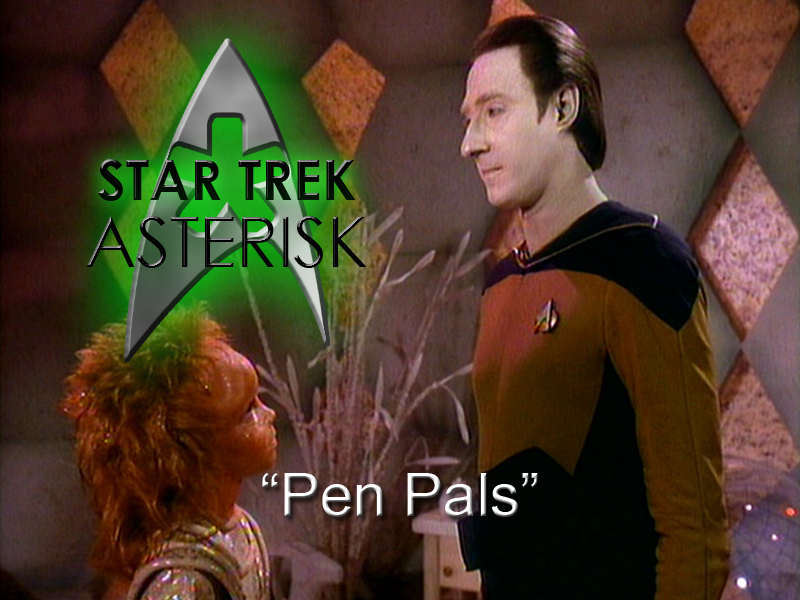 Star Trek: Asterisk "Pen Pals"
Data accidentally makes contact with a pre-warp alien girl and goes on to accidentally save her life by accidentally invoking a loophole in the Prime Directive. In the Selcundi Drema sector, plants have been breaking up and reducing themselves to rubble, so the Enterprise has been sent to find out why. Meanwhile, Picard decides to check out the holodeck and ride on a horse like his hero, the Old Spice guy. But just as he's about to hop on, Riker calls him to the bridge. They take a look at the planets that are breaking up and Riker has the great idea to put Wesley in charge of the science team that investigates it. What could possibly go wrong? Wesley is, of course, honored to be in charge of the science team, and he quickly picks out a team that should work out well. The only problem he finds is that he's not very confident about being in command. Which, I mean, is quite understandable since he's just an acting ensign, and a teenager at that. 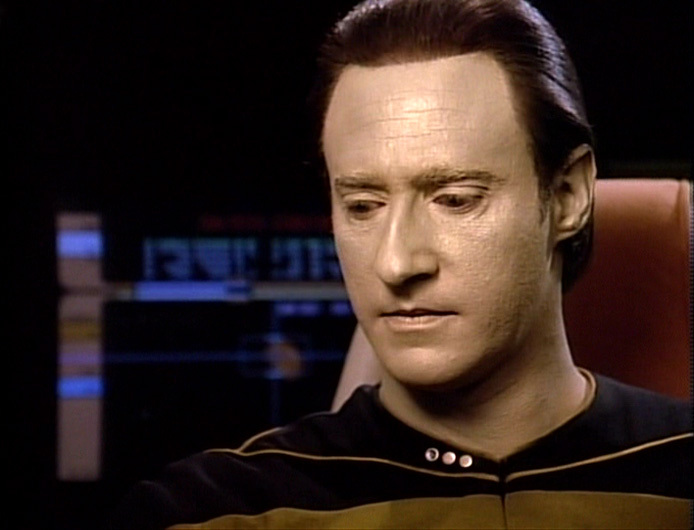 Meanwhile, Data scans the Selcundi Drema sector because of reasons, and randomly comes across a radio frequency. He tunes into it and hears "Is anybody out there?" And, of course, being the android that he is, he is obligated to answer the question: "Yes!" Back in the science team, Davies questions Wesley's order to run a test because it'll take too long and be a bit hassle and probably won't produce any results. Wussley decides Davies is probably right even though he really wanted that test run. He feels like he's losing command, so he goes to Riker for advice. Riker tells him that when Picard gives an order, people just follow it. Ya know why? Wesley doesn't know why, but Riker says when he figures it out, he'll understand command. Armed with this knowledge, Wesley runs a science experiment of his own and confronts Davies, telling him upfront to run the test. To his surprise, Davies complies! And Wesley knows all about command now! Meanwhile, the ship has been at work for about eight weeks and the entire time, Data has been carrying on conversations with the alien girl he found on the radio, Sarjenka. Because of the Prime Directive, he's kept the information he divulged very vague, but Sarjenka has told him a lot of details about her personal life. Mostly that her planet is going to hell in a hand basket and her family is about ready to run away. Data takes this info to Picard and Picard is disappointed that the Prime Directive has been stretched so far, but understands the dilemma of wanting to help this child. So he does what any good boss would do: calls a meeting. "Do we all have to be here for this?" 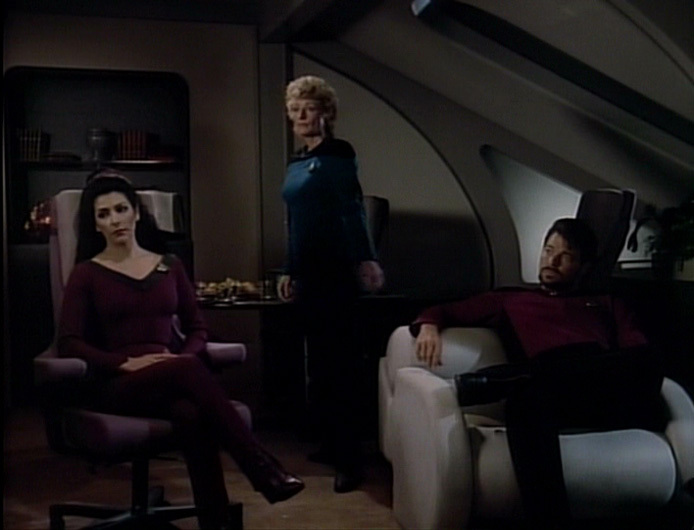 In this meeting they really pick at the Prime Directive and what it means in their predicament. Holding firm to the Prime Directive, the planet would run its natural course and Sarjenka and her family would die. The only way they could actively help them is if Sarjenka specifically asked them for help. So, Picard tells Data that no more communication is to be made with Sarjenka. Data goes to isolate her frequency in order to erase it from the ship's memory, but once he gets to it, everyone hears Sarjenka, and everyone hears her cry out for help. Well, now she's asked for help. They can save her. Which is convenient, because remember that scan Wesley wanted Davies to run, but he wouldn't do it until Wesley took charge? Well, turns out that scan revealed a way they can save the planet. It's all very technical, but basically they all they have to do is set up a probe and send it out there. Data is so excited that he wants to tell Sarjenka, but he hasn't heard from her on the radio in forever so he gets concerned 'cause stuff is still pretty bad down there. He beams down and finds that she and her family have already left. From the condition of the planet, it's possible that they didn't survive. BUT Sarjenka comes back for her radio and sees Data in her room. "My, what big positrons you have." Data decides that he just can't leave Sarjenka on the planet because it's really bad out there, so he beams back up with her. Which puts him in MOUNDS of trouble with Picard when he finds that Sarjenka, a pre-warp alien and a child no less, is on his bridge. He orders Sarjenka to sick bay, but she won't trust anyone but Data. So she stays until Data is done with his duty, which just happens to be saving her planet. Yes, that's the moment when Wesley is able to put his plan into action and send some probes down to the planet and keep it from breaking up. And Sarjenka is there to witness all of it. Once the planet is saved, she goes to sick bay. When she's in sick bay, Picard orders Pulaski to wipe her memory. So the good doctor whips up a chemical compound that'll do just that and gives it to Sarjenka. 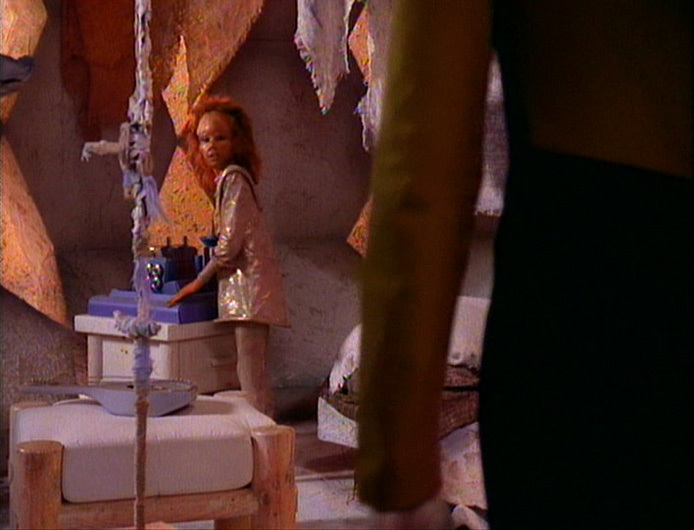 Then Data brings her back down to her home with a little memento that she'll not remember a thing about. When he gets back onto the ship, Picard tells him that he has learned about friendship and that makes him a little bit more human. Data likes that. I like how they delve so deeply into the Prime Directive here, but I kind of wish the conclusion was a little more believable. Erasing her memory seemed to be a little too easy. It seems to be something they could probably whip out whenever they needed, like using the transporter to heal people. I would like to have seen them put Sarjenka back on the planet without the memory wipe and explain that, as a child, no one's going to believe her anyway. 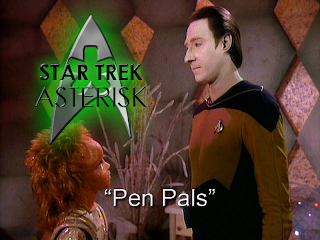 I dunno, it was pretty fun, anyway, watching Data befriend an alien child and break the rules to save her. This episode gets a B+.